I received a copy of “I’ve Been Thinking” ($20.00 value) in exchange for this review. Any opinions expressed here are honest and my own. 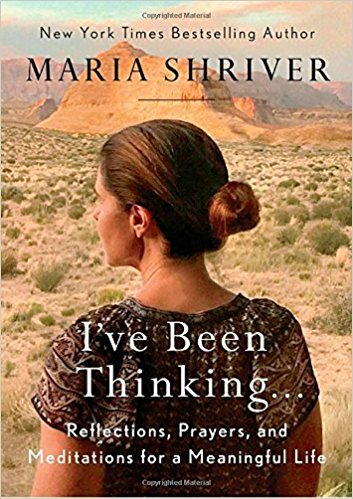 As I have never read any of Shriver’s previous books, I was pleasantly surprised how well I could relate to her book…I’ve Been Thinking……Reflections, Prayers, and Meditations for Meaningful Life. The book was very thought provoking and held a lot of faith in it which I was surprised. That in itself is a keeper for me as these types of books are hard to find as some tend to shy away with writing a book and referring to religion throughout….especially those people who are in the limelight. Each chapter began with a quote justifying the chapter and then ended with a prayer. Some of the prayers are so good, I just might sneak them myself for youth group gatherings on specific topics…such as gratitude, blessing of good health, kindness, and forgiveness. I enjoyed that Shriver was very down to earth and really shared the importance of family and faith and there is so much in life to enjoy if we just take a step back and look for it. There are so many things that are just fluffy in this world and when we step back and take a look at the basics and realize they have been right there in front of us in the first place for a meaningful life. All in all, good book and as mentioned, I was pleasantly surprised. At the very end she does a rundown of reevaluating life and touches on specific topics like work, men, love, etc and also mentions a specific religion, which I was a bit disappointed on some of her views, but I also realize we need to meet others where they currently are. I’ve Been Thinking can be purchased at Amazon, Barnes & Noble or anywhere books are sold. Get your copy today as you won’t be disappointed!